I absolutely adore this screen print by Jo Peel. 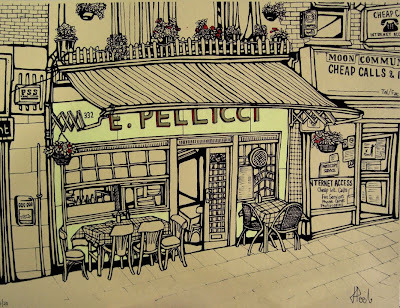 E Pellicci in Bethnal Green is a classic Italian Café that serves everything up with a huge side order of personality. I'm a passionate advocate for independent cafés, particularly the Formica clad, retro havens that only seem to exist in London now. I cried many a tear when the wonderful New Piccadilly shut its doors for the last time after 40 odd years of service. I have to admit I still visit the boarded up site when I'm up in London like a grave! 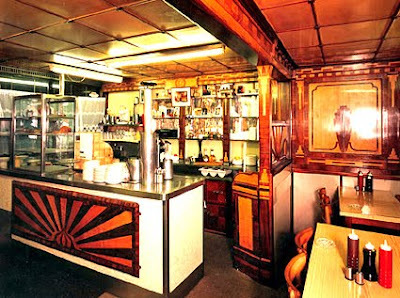 Luckily, E. Pellicci (above) has been grade II listed by English Heritage so it should stick around with its beautiful 1946 interior (some of it is earlier) for us to enjoy for many years to come. As for the others, a super, but dying list can be found here. Support them and keep them alive, the plastic identikit coffee chains really don't need you custom.